Location: This monument is located in Jaipur, Rajasthan. How to Reach: Hawa Mahal can be easily reached from anywhere in Jaipur, since it is a very famous landmark. Jaipur is synonymous with Hawa Mahal. This beautiful monument of India was built by Maharaja Sawai Pratap Singh in the year 1799. Also known as the Palace of Winds, this beautiful monument is the landmark of Jaipur. The monument is five stories high and the front of the monument is delicately carved with beautiful motifs. It provides an outstanding example of Rajput style of architecture. Hawa Mahal is not exactly a palace but a screen of superbly sculpted windows that look like the front of a palace. It was built for the royal ladies of Rajasthan who wanted to view the busy city life from inside a veil. Read on about Hawa Mahal of Rajasthan. The structure comprises of 953 beautiful windows made out of pink sandstone. These windows are known as "Jharokhas" and are built in a way that it resembles a honeycomb. Behind every window is a small chamber meant for sitting comfortably and viewing the busy city life. 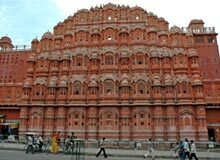 The palace is called Hawa Mahal because these small windows allow natural circulation of air, thus allowing ventilation from all parts of the palace. The monument is visited by scores of tourists every year, both local and foreign who are completely mesmerized by the sheer magnitude and elegance of this monument. The best time to view this monument is early morning during sunrise when it looks exceptionally gorgeous. The upper floors of the palace can be reached by climbing the narrow ramps. There are no stairs inside the Hawa Mahal. The palace is now maintained by the Archaeological Department. There is a small museum located in the premises of Hawa Mahal that houses ancient artifacts related to the Rajput lifestyle. This beautiful pink sandstone structure is a must see if you are visiting Jaipur. It is located right in the center of the city and can be easily reached from anywhere in Jaipur. You can always hire an auto or a taxi to get to this famous monument.